Gramophone Magazine printed my letter correcting the obituary they ran about Leonard Pennario. 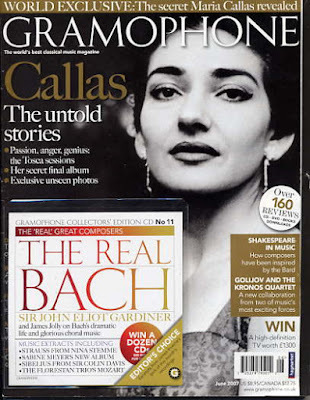 Gramophone is considered by many to be the world's top classical music magazine, so this is a big thing for me. It was gracious of them to run my letter, especially because Gramophone is a British magazine and I have been given to understand that they do not take easily to being set straight by Americans. They even ran a picture of Pennario! Not surprising, because Pennario is such a good-looking man. He sure beats Myaskovsky, a composer someone else wrote a letter about. Myaskovsky is pictured on the same page and he looks OK, I mean he is not terrible looking or anything, but he has this glowering look and I know who I would rather go out on a date with, I will say that. I used to tell Pennario, "Leonard, I am counting on your face to sell my book." That would make him laugh but it is true. How did I get onto all that? Oh, my letter in Gramophone. I wish I could link to it but you cannot get Gramophone online. My friend faxed me the page which is how I was able to see it. The new issue is not in Borders yet -- I checked yesterday -- but it should be soon. At which time I hope everyone gets out there and opens it up and checks out my letter. I am not asking you to buy the magazine because it costs $10. But check out what I wrote. And the picture of Pennario. Share the joy. As the authorised biographer of the great pianist Leonard Pennario, I often heard the handsome old man talk about how proud he was to have won the admiration of British audiences, particularly in an era when American artists were not readily accepted overseas. He also delighted in his collaboration with the violinist Jascha Heifetz, which he considered another highlight of his career. Knowing his feelings, I hope you will let me correct an error in your obituary article. Pennario did join Heifetz and cellist Gregor Piatigorsky in the early 1960s, as you noted, for a historic series of concerts and Grammy-winning recordings. But your assertion that "Pennario's style was not ideal for chamber music and he left" is wrong and unfair. With his extroverted, passionate playing, limitless virtuosity and uncanny reading skills -- in addition to charm and tact -- Pennario was a master of chamber music. Heifetz understood that, and so did other stellar musicians who sought out Pennario as a collaborator, including violinists Ruggiero Ricci and Henri Temianka and cellists Lynn Harrell, Joseph Schuster and Nathaniel Rosen. The Heifetz-Piatigorsky-Pennario trio was never intended to be permanent. All three musicians, who remained close the rest of their lives, had schedules that would have made such an arrangement impossible. They had a good run, though -- from 1961, when Heifetz first phoned Pennario to suggest they team up, through their sold-out Carnegie Hall appearances in the fall of 1964. Their collaboration proved more enduring than the much-earlier trio of Heifetz, Piatigorsky and Arthur Rubinstein, which began in 1949 and lasted only a year. How about that? Remember, I wrote in here about writing that letter. They ran it exactly as I wrote it except they changed "authorized" to the British "authorised." I love that. So much excitement! Thank you, Gramophone! What with all this excitement, I almost forgot to write about the supernatural story of the day. But now I remember. The Tarot cards! Once I went to this party. I was about 18. This person was there who announced she was going to do Tarot card readings. Being ignorant back then, I stepped right up. She laid out those creepy, spooky Tarot cards. Then she stared at them. Then she packed up the cards and said she did not want to do this reading. She looked really dark and upset and refused to attempt to tell any more fortunes. Shortly afterward, she left the party. How is that for showmanship? At least I hope that is what it was! Maybe she foresaw the erroneous obituary Leonard Pennario would get in Gramophone magazine. If so, I can understand what she was so upset about. I wish I could reassure her that everything turned out fine. Congratulations on a well written letter correcting an error. I am glad that they published it. Good for you!